The other day, Anemo was walking down our impossibly long hallway after returning home from school. I heard him ask Suzanne if "Amharic Man" was home. I had to laugh. I had never heard him call me this before, but I considered it an honor. I certainly want Anemo to see this linguistic effort as a salient feature of my current identity (though perhaps not the exclusive feature). One of my project's goals is to have a kind of incubating impression in Anemo's mind. Thus, even if Anemo learns precious little Amharic during my year of language acquisition, as long as the seed is planted I will be gratified. Yet I have been pleasantly surprised by the interest Anemo has taken already, even if some of it is subconscious. 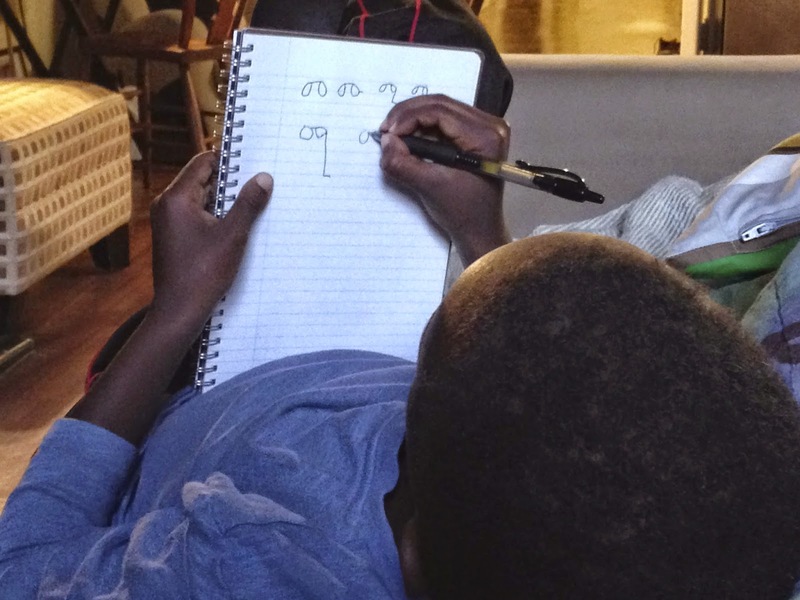 For instance, last week while playing a game on the living room floor with his good friend Yoyo, a boy also adopted from Ethiopia, Anemo began absentmindedly repeating the same Amharic word—mawuk'—over and over again. (Simultaneously, Yoyo was singing the instrumental riff from Stevie Wonder's "Sir Duke," making for an interesting counterpoint.) I think the word stuck in Anemo's head because of the distinctive click sound on the 'k', known properly as a velar ejective. After saying the word a number of times, Anemo looked up and asked, "What does that word even mean?" Good question. I had to go back to my elevator speech to find the answer. 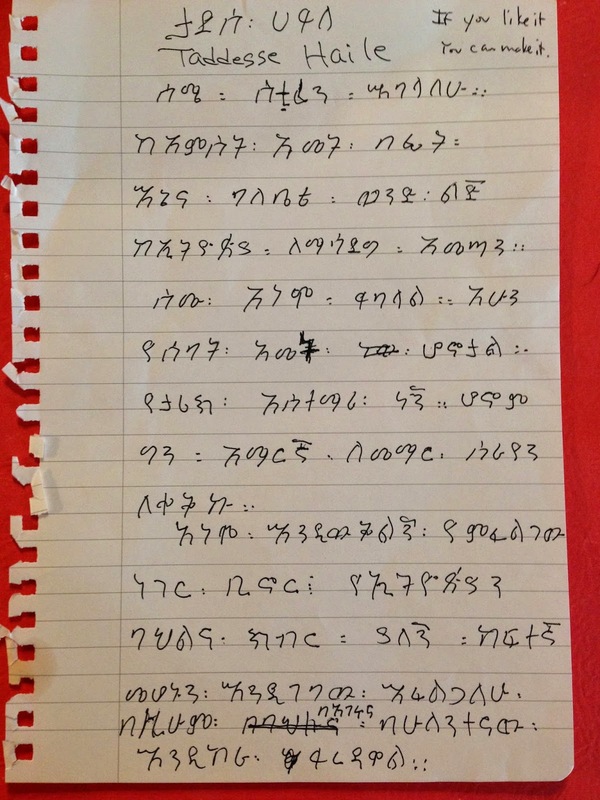 Anemo's curiosity helped reinforce an important Amharic word. Another time Anemo wanted to practice more of the Amharic letters. Here he is writing the 'm' group of syllables, one of which begins the word above. Anemo slowly becoming "Amharic Boy"
Meanwhile, I met my own "Amharic Man" at the Oasis Café, the place where I launched this project on April 21. Back then, I had given my elevator speech to Abeba, the kind woman at the counter, who said she would pass it along to her husband to translate. But I had not returned since. 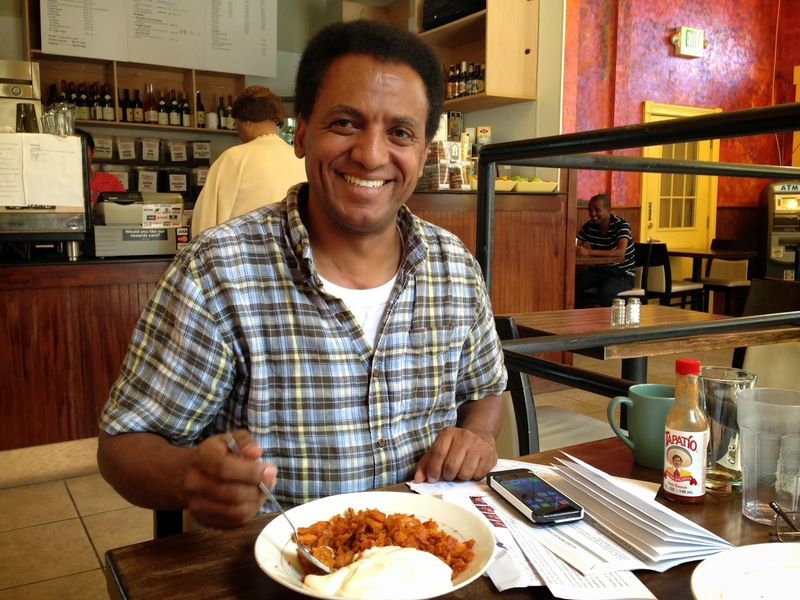 Abeba introduced me to her husband, Haile, who was eating lunch and doing some paperwork for the café. I liked him immediately. When Haile couldn't locate his translation of my speech in the cash register where he had apparently left it, he offered to do it over again right then. Haile's offer of assistance was so earnest that I didn't tell him the translation had already been done. Anyway, I figured that having a different version would help me learn other ways of saying the same thing...like even how to introduce myself (simay Stephen nuh-w vs. simay Stephen yibilal). I brought Haile's translation to Lulit to decode. She detected a little bit of Tigrinya influence. It turns out that Haile was indeed born in Eritrea though he grew up mostly in Addis. He speaks Amharic, Tigrinya, Oromo, and English. In fact, Haile has such a superb command of the English language that he was able to question me pointedly about how my wife and I are raising Anemo in the United States, particularly around the issue of race. Fundamentally, I felt a deep respect emanating from Haile's interrogation, both toward us as parents and toward Anemo. (When Haile saw Anemo's photo, he wondered what region of Ethiopia Anemo came from. I was pleased Haile expressed a positive opinion of Anemo's ethnic group, the Hadiya, referring to them as strong people.) I certainly appreciate pointed and challenging questions when they come from a place of goodwill, and so I look forward to many more conversations with this "Amharic Man" over the coming months, both in Amharic and English. 2014. Watermark theme. Powered by Blogger.